As a passenger, you always run the risk of losing your belongings at least temporarily causing you immense hardship. As your baggage is handled by multiple agencies including baggage handlers, gate agents, security personnel and others, the possibilities of your baggage being misplaced or lost is fairly high. 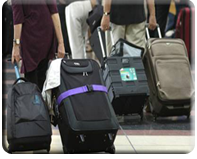 A large number of airline and airport employees do their jobs every day without any intentions of stealing your bags. There is no denying that they a true bunch of honest and hard-working people. But there are always some bad apples and you need to guard against them. It may be a small group of people or a couple of individuals who constantly watch your movements to know how vulnerable you are to theft while traveling. are a few worthwhile tips to keep your stuff safe while flying. Before you leave your home for the airport, pack all the valuable stuff like identification, wallet, cash, jewelry and all important documents into one package and keep constant vigil over it. Make sure that you do not use plastic bags or any transparent wrapper so that people are able to see the contents. The wise thing is to keep all the papers you need at the airport like your identity card, air ticket, boarding pass etc in one separate cover so that you are not required to open or empty all your bags ferreting out those papers. Never naively tell the security or gate person or any other baggage handler in loud tone "This contains my wallet, my ID, and my watch," as there is no need for such open declaration that will be audible to many. It is not that all other things are less important and you can afford to lose them. But the simple fact is grocery, toiletries and clothing are readily available and you can buy them anew by spending some dollars -- but without your ID and credit card and wallet, you will be completely lost and can not even rent a car, check into hotel or eat out. Having the credit card handy at the airport or on board the plane has an added benefit beyond the safety factor. This is a simple way to buy a snack, a drink, headphones or an in-flight movie. Keep any prescription medications guardedly as these can be difficult to replace quickly and being without them can create potentially dire problems for people with chronic illnesses. would be to wear them rather than carrying them inside a bag increasing the possibilities of losing them. The simple thing to remember is – “If you do not want to lose them, wear them”. Never remove any valuables from your bags – for whatever reasons - while waiting at the business class lounge or sitting inside an aircraft. Rush to the area of the airport where your baggage will be unloaded as fast as possible after your flight lands. Watch eagle-eyed as flight's bags are dumped down a chute and grab yours at the first conceivable opportunity. If bags are being unloaded on the tarmac from a small plane, closely watch for yours until it is in your hand. If your bag does not show up on the baggage carouse, rush to the nearby baggage office or lost luggage window and report the matter. Do not panic- - your bag may just be delayed and coming in on another flight.